Fix common Realtek audio driver issues with this software! Realtek HD Audio Manager is one of the most widely available sound card driver applications, dedicated to provide users with Realtek sound chips on their motherboard with the most accurate sound quality, access to all features of the onboard hardware, resolve compatibility issues that may be present with basic Windows drivers, fix various errors that may appear during the throughout the product's usage, and add support for new operating systems. This driver package comes with the support for all the major sound codecs, giving your PC support to process audio, playback multimedia, record audio, manage speakers and more. 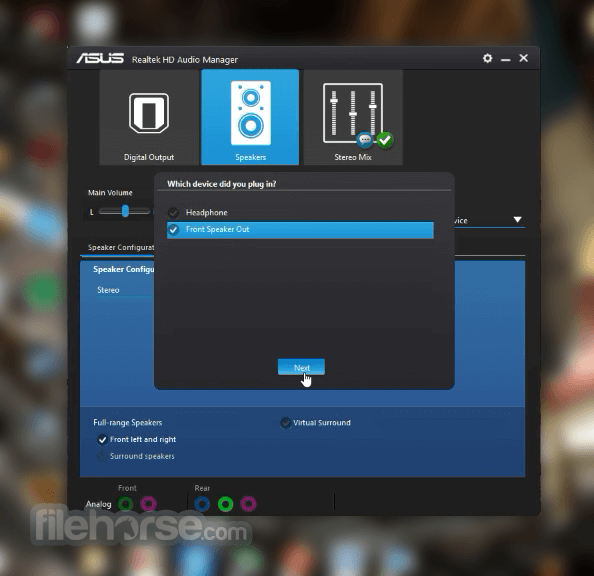 How to reinstall realtek hd audio manager on Windows 10? Check out now! 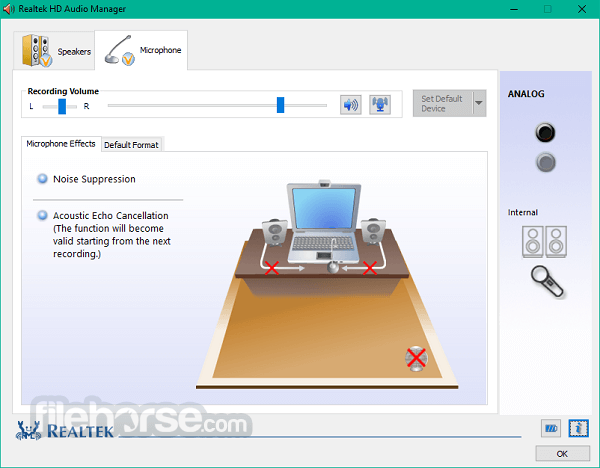 Realtek HD Audio Manager comes in a single installation package that can be easily installed on any supported Windows OS (Windows XP, 7, Vista, 8, 8.1, and 10) by simply following on-screen instructions. In addition to automatic install, you can also install the Realtek sound driver via the Update Driver Software feature found in Device Manager. Use “Let me pick from a list of device drivers on my computer” and “Have Disk” buttons and point the update tool toward the folder where you have extracted the .cab file from the Realtek driver package. After either automatic or manual installation, make sure to restart your PC. The main interface of the HD Audio Manager can be accessed via icon in the Windows taskbar. The user interface of the app features two tabs (for management of Speakers or Microphone), with in-depth mixing for both Left/Side ratio and Volume, Speaker configuration, surround sound tweaking, and audio jack source re-tasking. Sound Effect tab can be used for choosing of the emulated sound environment, equalizer presets or tweaking of mic sound for Karaoke. 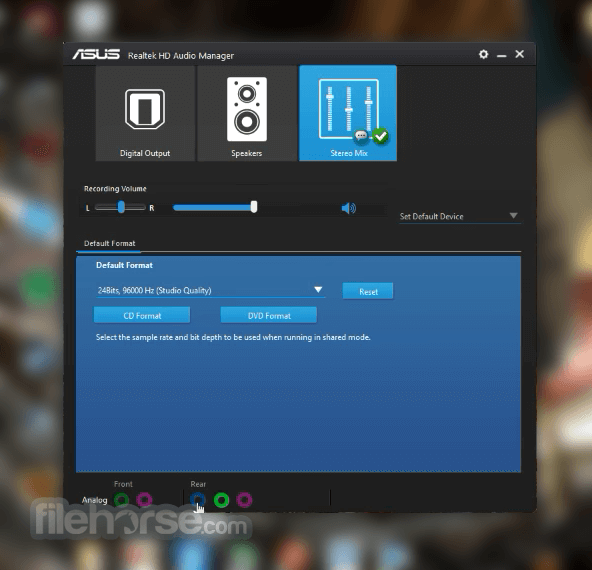 In addition to providing deep driver support, Realtek HD Audio Manager features an excellent user-accessible utility for managing your sound card capabilities. Its streamlined UI can be used to manage sound inputs, re-assign audio ports to any of the preferred inputs/outputs, flexible mixing, fine grain coordinating functions and setting up of the sound stage (headphones, stereo, surround, with dB gain and distance settings). The audio manager can also be used to set up 3D sound rendering and speech synthesis. Options for audio input (microphone) are also fully featured, including an equalizer, noise suppression, beam formation, and Acoustic Echo Cancelation. Users on laptops can also take advantage of the Power Management feature that can be accessed via little battery icon in the bottom corner of the HD Audio software window. In it, you can disable various power-draining audio features when your laptop is running on battery power.